This ornament is hand made by me and is part of my limited edition series which is why it is more expensive. Right now there are just a few available. This ornament is a perfect way to commemorate a vacation in Amish Country. 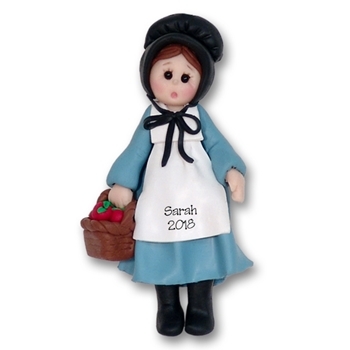 The Amish girl is beautiful detailed with her apron, hat and basket of apples. Comes complete with a hook and satin ribbon for hanging. ALL ORNAMENTS ARE DESIGNED AND COPYRIGHTED BY DEB & CO. AS WELL AS THE PHOTOGRAPHY.